The seedy tavern located in Shadowmire is called the Kraken’s Wake. I wondered what in the world could have justified such a name. Sure, it is located near the docks and reeks of salty fish but does that mean that it warrants such a bold name? The first time I set foot in the Wake, I was amazed; not with the decor or the ambiance, but the amount of grimy shady characters that were piled into the den. These people made Slanter look like a kid. I assumed, in my ignorance, that the Kraken’s Wake had gotten it’s name by an owner who simply wanted his tavern to sound tough. It just wouldn’t do to have a sailor drinking in a place called Peppermint Dust or the Unicorn’s Mane. What I did not know, was that the name was very much deserved. 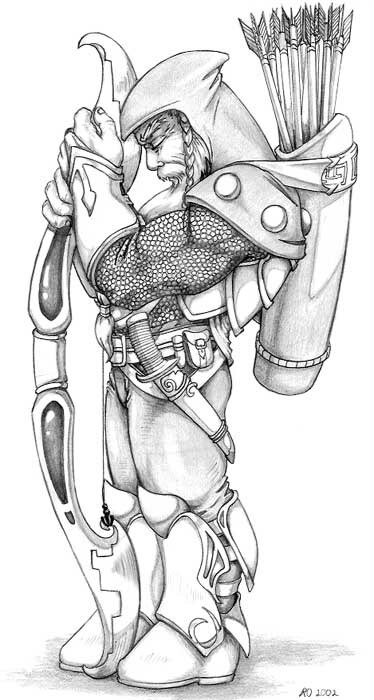 The owner of the Kraken’s Wake, Admiral William “Billy” Bligh, was a great sailor and a hero of the Halfling War. He decided to settle down in Shadowmire mainly because he hated trolls, and wanted to kill as many as he possibly could. I never even noticed the old relics which adorned the walls inside the tavern. Several paintings, done by Billy himself, tell some interesting stories from his time on the sea. I, like so many others, was far too busy making sure that I made it out alive to look around. Slanter took the time to fully digest the paintings; a feat which I am jealous about. He relayed to me what he learned. The real secret to the Wake lies under the water. According to the paintings, Admiral Bligh befriended a rare sea creature. 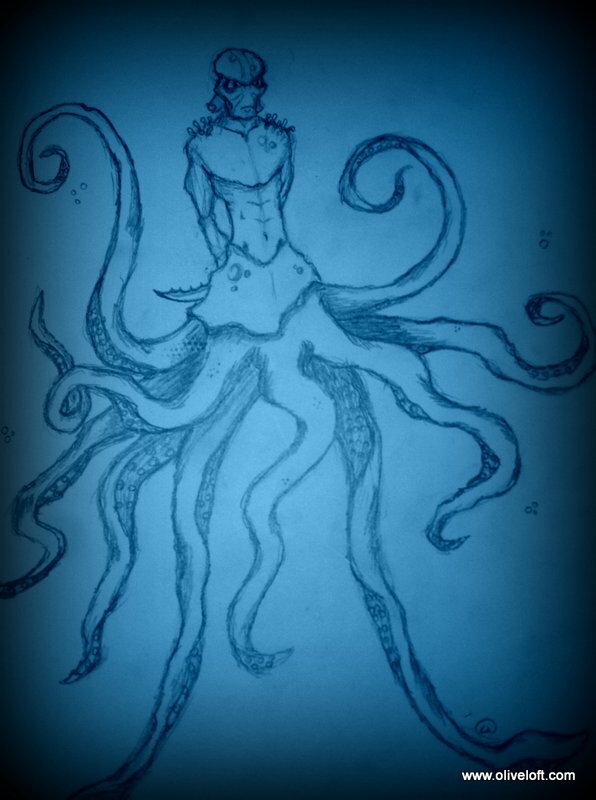 The creature was a cecaelia, half humanoid and half octopus. The torso resembled a giant while the bottom half was a tangle of powerful tentacles; bringing the creatures full size to over twenty five feet. This particular cecaelia, who came to be known as Dreadnought, decided to follow the admiral. 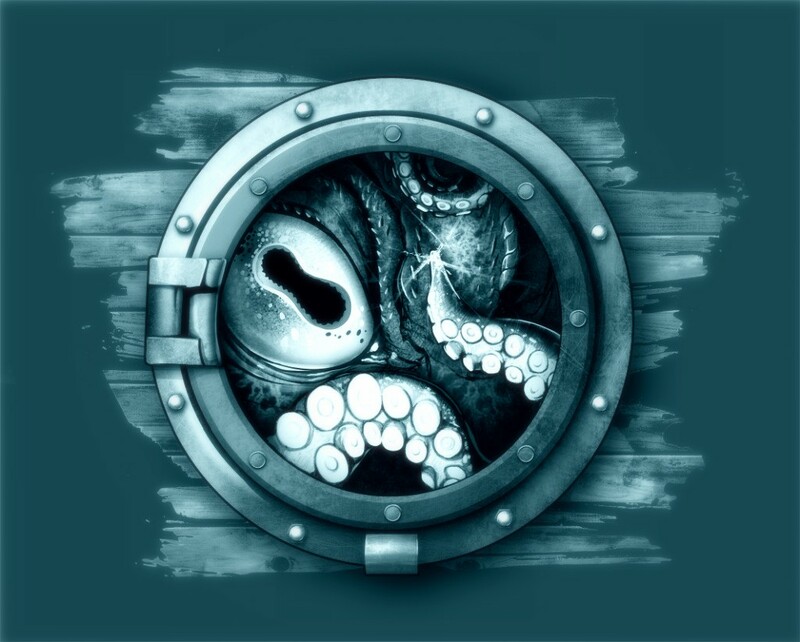 For years, Dreadnought lived in a cave under the Kraken’s Wake. The friendship between the former admiral and the cecaelia never faltered. So you see, Dreadnought IS the kraken; and the tavern is always safely in his reach. When I first entered the Kraken’s Wake, wearing my fresh new Rosewood armor, Dreadnought was probably swimming under my feet. The cecaelia was fighting trolls along with the rest of us during the Moon Over Mire carnival, which started the War of Horded Magic. 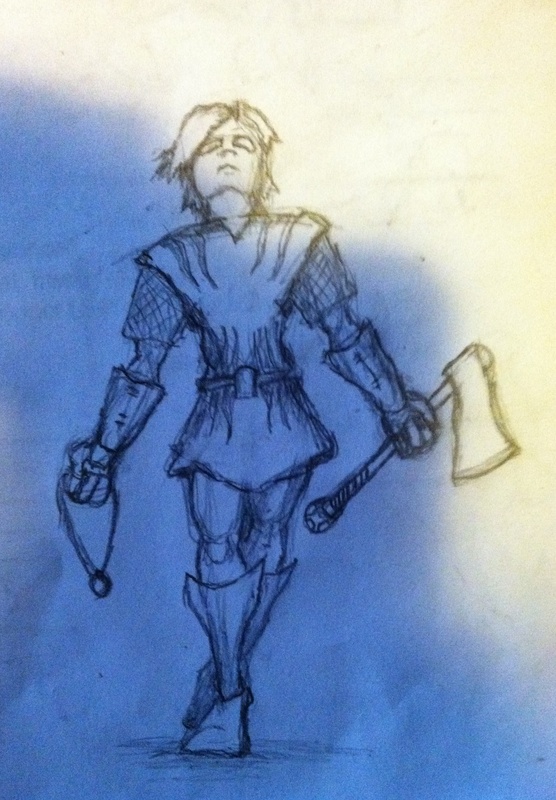 I mentioned that I had been struggling with a sketch of my main character, Penn Darvel. I drew something up at work today, and think that it is better than what I have now. I am still not 100% pleased, but I believe it is a step in the right direction. Tell me what you think, please. Every year for the Festival of Serynade, my dad would give me a new pair of leather gloves. I always knew what was in the box, but I would act surprised every time. As I opened my package, the smell of the fresh leather would come wafting out. I loved that smell. I would put the gloves on and cover my face with both hands. For several moments I would just breathe in the odor. Now here I sit, readying myself to fight trolls with Jericho, the therian king. I watch everyone else as they prepare. Slanter is sharpening his phoenix-fletched arrows. Zipporah tries to appear confident, but I can tell in the tension of her hands that she is nervous. Syris, the dust elemental, is sitting quietly; a sure sign that things are serious. Pnils is burdened with a sadness much more cruel than any cut of a troll blade. He is a rock, though, for he knows that we need him. Tori is giving instructions to Master LePrius on how to care for each of the orphan children. King Jericho is lining out plans with Rasul, who wants to stay and fight so badly but refuses to even protest against the king’s wishes. Baron, the werebadger, is saying goodbye to his family. I think of my family, and I wonder what they would have me do. Would they want me to go to safety with Rasul and LePrius, and leave the battle for those who are better equipped for such tasks? Would they want me to stay and fight alongside my new friends? I lower my head into my hands, at a loss. Then I smell my newly purchased leather armor. 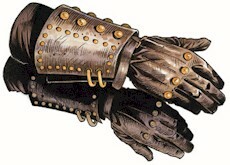 The sweet aroma of the Rosewood gauntlets take me back to those holiday mornings with my dad. I guess I will always associate that smell with him. I know what he would want me to do, so I go over to Slanter and ask him if he minds sharpening my axe as well. The targets were placed and the contestants were ready. The crowd was large and included the elven princess, Damara. The archery contest of Alhaven was the most prolific bow contest in Delphia. The greatest archers from Pinevale to Dundersnuff would all come to compete. It was a joyous time, and the only time the elves allowed guests near to their home. The elven king, Typherius, had tried to cancel the contest but his people had convinced him to continue. The field had been narrowed down over the last two days, and only three contestants remained. There were two male elves and ,to everyone’s surprise, a dwarf. Sinto, the first elf, stepped to the line. He had blonde hair which was braided behind his ears. Sinto was the female’s choice, for he was lovely and of strong build. His green eyes narrowed as he focused on his target. 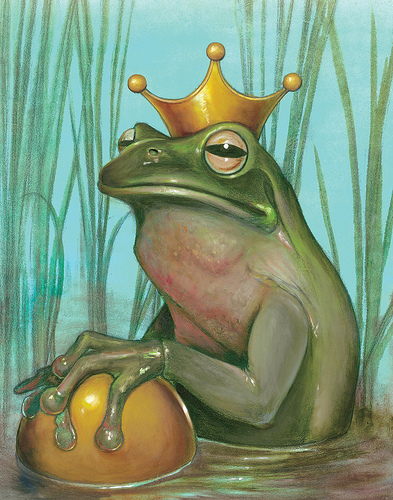 He raised his bow, white wood with intricate etchings of green, and pulled his swan-fletched arrow from his quiver. Sinto made a great spectacle of every motion, flexing his arms which he was always sure not to cover.He pulled the arrow back and held the bow steady. The elf kept the pose for a while, showing off his taut muscles. Then he let the arrow fly, but the arrow missed the bullseye by a hand. The men in the audience giggled at Sinto’s mishap. “Perhaps he shouldn’t have posed for so long,” they teased. But the women cheered all the same, for they did not care about his archery skills; not really. Sinto smiled and gave the crowd a wave, but he could not hide the disappointment in his eyes. Next the dwarf, Reif, stepped to his line. His hair was light brown, and his beard was neatly braided into several strands. He wore a shirt of earthen tones; simple yet undeniably beautiful. Reif had become a fan favorite with his powerful bow burying arrows to the fletching. He looked around, somewhat nervous. Then the dwarf focused his gaze on the princess as beads of sweat poured from his face. One of the elves in attendance, Dagoby Trueflight, had intently watched all of the dwarf’s previous shots. Reif had never seemed nervous at any point in the previous competitions. “He is just edgy because it is his final shot,” Dagoby reasoned. However even as he was reasoning, the elf was making his way toward the grandstand where Damara sat. Dagoby was part of an elite elven military unit called Crimson, and he trusted his instincts. He had spent 400 years honing them. Reif finally tore his eyes from Damara. He toed the grass with his boots, and then knelt. The dwarf picked up some dirt and rubbed it together in his hands. Then he grabbed some grass and threw it in the air as he stood. He was gauging the wind. Alarms burst out in Dagoby’s mind. The wind would have no effect on his short ranged target shot. “He is planning a longer shot,” the elf declared. 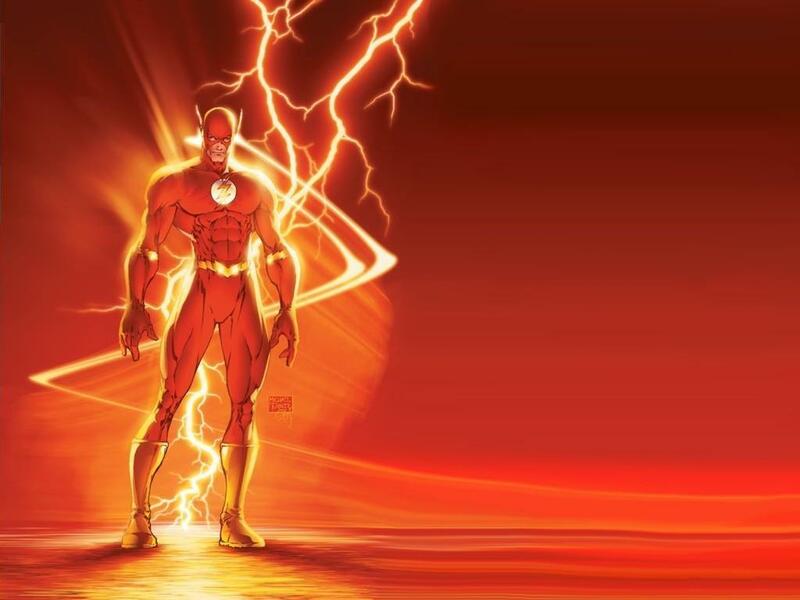 He knocked a few people over as he began his sprint to the princess. Reif had his large black bow clutched, and pulled his falcon-fletched arrows from his ornate quiver. He took a nice deep breath, then drew. Everyone held their breath as well. Then, Reif turned and shot his arrow directly at the princess. Everyone was too shocked to move; everyone except Dagoby. Only two dwarves remained; Ballack and one they called “the Hook”. The two were back to back with Ballack using his necrotic magic as a protective orb. “I can keep this up all night, scum!” the warlock promised. At that moment to the south, a huge pillar of fire shot into the night. The trolls had been instructed to return to Shadowmire with any captives upon seeing the pillar of fire. 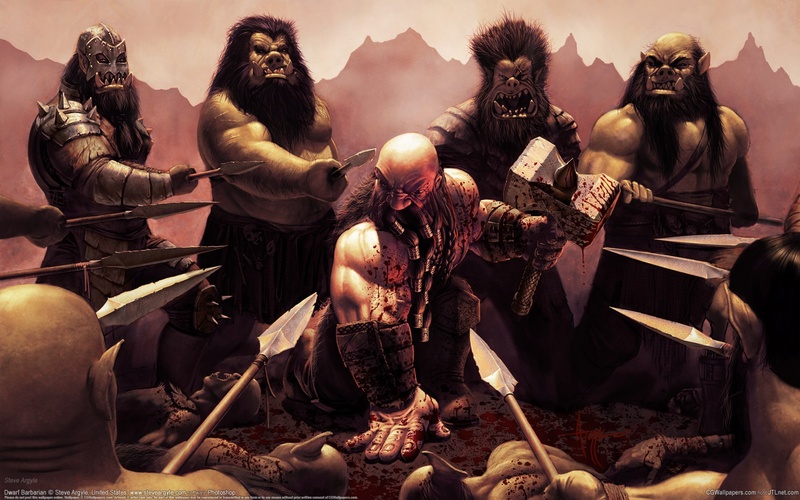 Most of the trolls hustled away from Ballack and his cruel hammer. A few remained, but they never made it back to the therian city.